In the far south of Tasmania, on the Tasman Peninsula, is Port Arthur, which in the early 1800s was originally a timber station. In 1833 it became a prison settlement for male convicts, and quickly established a reputation as being 'hell on earth'. Today Port Arthur lies among 40 hectares of English Oaks and magnificent gardens as a memorial to Australia's convict past. The Port Arthur historic site offers an inclusive all day ticket, which includes a guided historical walking tour of the ruins and restored buildings, a harbour cruise and access to the visitor centre and interpretation gallery. One of the more popular features of a visit to Port Arthur is the Historic Ghost Tour run at night. 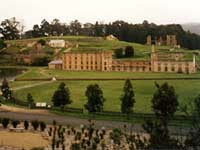 Port Arthur is located 65 miles (100km) southeast of Hobart. Allow about an hour and a half to enjoy the scenic drive along the Tasman and Arthur highways.